Energy-efficiency is a buzzword everywhere these days, and with washing machines, the more efficiently it uses power, the cheaper it is to run. After all, budget is going to be a point to consider when you choose your model, so if you can save on running costs, that’s great! Also, you want to do your bit in being greener, so that’s another bonus! Here are 5 Energy-Efficient Washing Machines on the UK market in 2019. ​Having "Energy Efficiency" down as a priority is a great way to approach buying a new washing machine. To help you out, we've only included those rate A+++ (the highest rating) on our list. However, taking a note of the following features will help you get a model that can handle your family's laundry at the right price. ​Sizes 6Kg - 7Kg ​are ideal for one-person or a couple, whilst 10kg and above is​ better suited for a larger family. Spin Speed - The highest spin speed is 1600 rpm, but many washers are rated 1400 rpm. There is a bit of a trade-off here. Higher speeds are preferable as they remove more water and make drying your washing a lot quicker. Quick 15-minute washes also use higher-spin speeds, too. On the other hand, you might be surprised to learn that the higher speed is rarely actually used. Some programs like cottons will use it, but many don't. There is also the noise consideration. Faster is better - but not if it sounds like a jumbo jet is taking-off in your kitchen. Functions – the latest models are a long way removed from those of just a few years ago, and some come with impressive and useful features. Look for a quick wash function – very useful for when you are going out and can’t find anything to wear – and heavy-duty settings for the kids. Anything that makes your life easier is worth having! Timer – you need a timer. This enables you to set your washing to be carried out when you are not at home, or at night, or​ the most convenient time for your family. Some machines can even be set by Wi-Fi and smartphone apps, if you want to go that far! Noise – a washing machine, thanks to the fast-spinning drum especially, is a noisy appliance, and we have included output levels (at spin speed) in our reviews. ​Bear in mind that the scale for measuring noise output can be confusing: to give you an idea, 80dB is twice as loud as 70dB. Maintenance and Warranty – as you are buying a new washing machine you want it to be backed by a sensible manufacturer warranty and to require minimal maintenance. Check the reviews for further information. When considering the​ best energy-efficient washing machines, we kept in mind all the key features that we outlined above. We're confident you'll find something on our list that fits with your budget and ​family. ​Samsung, a worldwide giant in the appliances market, has developed a concept it calls ‘Ecobubble’, which involves clever use of water for better results with greater efficiency. ​This is an A+++ rated model with a 1400 rpm spin. ​On average, it uses 166kw ​a year. ​Whilst this is pretty decent ​its not great considering it is only an 8kg capacity machine. However, it does only use 8,100 litres of water a year which is incredibly efficient when compared to similar appliances. You also ​get a lot of features that some comparable models don't have. ​The most marketable is the "Ecobubble" feature. Samsung say the bubble-generator located under the drum helps the water penetrate clothes and protect clothes better. Here is a video from Samsung demonstrating this. ​The clever design helps keep water usage to a minimum. However, this one does put out 79db during high-spin, so it is a bit on the noisy side! There are 14 different wash programs including a mixed-load cycle and a 15-minute quick-wash. As you would expect from any decent washing machine, there is a 24-hour delay timer, an eco drum cleaning pre-set, and a child-lock to keep wandering fingers away. ​The Eco-bubble feature also prevents build-up on the drum and elsewhere, that's another big plus. And last but not least there is a generous 5-year manufacturer's warranty. ​You can usually expect to pay extra for A+++ machines, so it's nice to see this available for a great price with a long warranty included. ​​Hotpoint is a perennial favourite in kitches up and down the land, and in the Aquarius they have an A+++ rated washer at a great price. 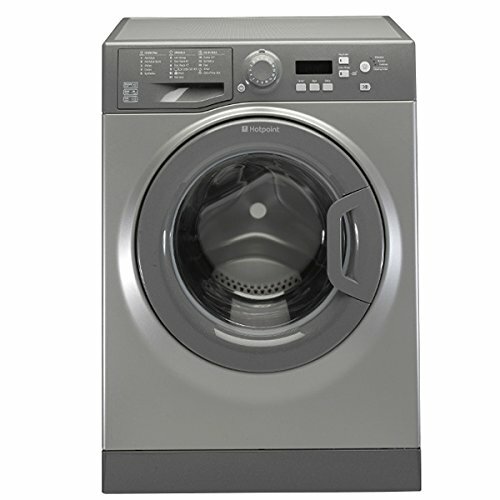 ​​The Hotpoint ​boffins say this model uses an economical 196 kw/h of electricity on average per year. ​This works out at 30.18 a year (using 15.4p as a weighted average per hour). It also uses 12,254 litres of water, which is 50% more than the Samsung Ecobubble. Of course, you do need to factor in this Hotpoint model has an extra 1kg of capacity - but that is a lot more water. It does have some features that the Samsung doesn't have, though. The temperature and spin speed is variable, which is great it winter as you can increase the speed to reduce your drying time. An "Anti-allergy" setting will really please asthma, hay-fever and allergen-suffers. As we pointed out in this blog post, washing clothes at 60C kills a lot of harmful bugs and bacteria. There is also a Smart Intensity button which has three settings for getting rid of stains and improving performance. There is a "Speed+" setting which decreases the total time of a cycle by 50%. This is ideal for lightly soiled garments and will save time and water. The "Performance +" setting on the other hand improves dirt softening and removal by 15% (and Hotpoint point out this was verified at an external lab). There is also an "Auto +" setting which balances the load and makes changes to the cycle time to save water. In addition to these features, there is also a 15-minute fast wash, and a self-clean setting where you let it spin without any clothes inside. To seal the deal, Hotpoint provide a free 10-year parts and one-year labour warranty. And it's available in graphite too, which is a rarity it seems! Whilst I do have concerns about the water usage, this is really economically priced, so you'll have a bit extra for your water bill. All in all, this is probably the best energy-efficient washing machine for the money in 2019. ​The next "Big Brand" under review is Bosch, and with this Series 8 you get A+++ energy-efficiency, the fastest 1600 rpm spin and a large capacity. But is it worth the large price tag? ​​​Well, the initial stats are all very favourable indeed. It has a super-low energy usage of just of 152kw / year - at an estimated cost of just £23 (taking 15.4p per hour). Considering this is a 9kg machine that is very good. Water usage is also good at 11,220 Litres per year - over a 1,000 litres less the Hotpoint Aquarius. ​​And at 73db during high spin, it's quieter than the above two models. Which is impressive as they both have a slower 1400 rpm spin. I guess we shouldn't really be surprised by the level of German-engineering that has gone into this one! It has clever anti-allergy settings that deal with pollen and other common allergies, a 15-minute fast wash and a sports-wash.
Aside from the price, the only downside is the measly 2-year manufacturers warranty. This has obviously been built to a high-spec, so I wonder why they didn't match Hotpoint or Samsung in this department. In terms of energy-efficiency and quietness though, if the price doesn't put you off it is the best on the UK market in 2019. If you're looking for a large washing machine with great energy-efficiency, it's hard to beat the LG TrueSteam. This A+++ 12Kg Energy-Efficient washer is a perfect example of why LG are beginning to make a name for themselves in the kitchen. It uses just 120w/h a year (£18.60 at an average of 15.5p an hour) which is better than most 10KG models. In fact, only 44% of water is left on clothes after the cycle is finished. That is much less than the average machine which leaves > 50% and means it will take less time and energy to dry your clothes. As well as being both electricity and water-usage, it's also pretty quiet putting out just 70db during high-spin. You do need to factor in that this is a 1400 rpm machine so it should be quieter than 1600 rpm models. LG majors on innovation, and this model comes with Wi-Fi controls that can be accessed via a smartphone. It also has a number of patented functions designed to improve efficiency and reduce the running costs, including "Turbo Wash" which sprays water directly onto the clothes instead of soaking them. The drum on this model has "6 motion technology" which is meant to mirror hand-washing. It moves in different directions depending if you're washing silk, denim or delicates. There's also a"TrueSteam" feature also uses steam to remove 99.9% of allergens , making it a great choice for asthma and hay-fever sufferers. All in all, this has a great range of features and does include a 14-minute quick wash program. The big drawback with the LG Truesteam is the price. You can get a couple of budget-machines for same price. Plus you only get a 2-year warranty - but a 10-year motor warranty. However, it's hard to large-capacity washing machines that have great energy ratings. It does involve a larger initial outlay, but the low running costs will help you make savings year-after-year. ​Another favourite on the UK market, Zanussi are known for their quality appliances at a sensible price. ​As with all the others on our list, this has the maximum A+++ but ​as we've seen from the others, that only tells part of the story. Delving deeper, we see it uses 232kw ​per year, and this would cost £36 (taking an average 15.4p per hour). Truesteam - albeit at a much lower price point. However, one are it really does excel is in water usage. 9,800 litres a year makes it the lowest on our list, and beating the much more expensive machines. The reason for this is Zanussi's "Aquafall" Technology, which intelligently adds more water as and when needed. ​Zanussi have also added an inverter motor and this helps keep the noise down to just 54db during normal operation and 78db during high-spin. Again, these are pretty good stats and people have made 10-hour videos on Youtube to help baby sleep! There are 14 wash programs including "Easy Iron" and a 30-minute quick wash - which is double the time of the others on our list. Another place is loses points is the Manufacturers Warranty. Zanussi just offer 1-year, which I think is the statutory-minimum for white goods! If you have a large family and saving water is your aim (whilst not breaking the bank) the Zanussi Lindo 300 does have a lot of appeal. ​If we had the pick of any one of these washers, we'd have to go with the Bosch Series 8. ​Not only is it energy-efficient, it's super quiet and features like "Anti-Allergy" and the "Sports Program" set it apart from the rest. We also have to give an honourable mention to the Hotpoint Aquarius, which is very affordable with some great energy-saving features, too.